Excuses Fail an Islamist "Charity"
Originally published under the title "Islamic Relief Fails a Whitewash." Nouman Ali Khan, an honored speaker at a May 20 Toronto fundraising event by Muslim charity Islamic Relief, advocates wife-beating and prostitute-whipping. On May 20, a Muslim cleric, Nouman Ali Khan, spoke at a fundraising event in Toronto for Islamic Relief, one of the largest Muslim charities in the world. Khan preaches that prostitutes and pornographic actors are "filth" and that "you have to punish them ... They're not killed; they're whipped. And they're whipped a hundred times." Khan has also declared that God gives men "license" to beat unfaithful wives, and that Muslim women are committing a "crime" if they object to the religious text that he says permits this abuse. Before the event took place, this author had written about Khan and Islamic Relief in the National Post, with the help of colleagues at the Middle East Forum. Islamic Relief did not much care for the exposé. Reyhana Patel, a senior figure at its Canadian branch, first persuaded the Post to bowdlerize the article by removing some of the sourced material and adding sentences in defense of Islamic Relief. Patel then published in the Post a response that denounced our research as "false... one-sided and unsubstantiated." Really? In a rather major failing, she failed even to address Nouman Ali Khan's presence at the Islamic Relief event. Instead, she boasted of her own humanitarian goodness and attacked the Middle East Forum (MEF) as an "anti-Muslim think tank" that "uses some of its resources to paint a negative picture of Islam and Muslims." MEF has always, in fact, argued the very opposite. It believes that if radical Islam is the problem, then moderate Islam is the solution. This very maxim can be found in dozens of articles on its website. MEF supports a number of moderate Muslim groups working to challenge extremism, and encourages others to do the same. It is old habit of Islamists to accuse anti-Islamist activists of being anti-Muslim. It is an old habit of Islamists to accuse anti-Islamist activists of being anti-Muslim, because it allows them misleadingly to conflate Islam and Islamism. That obfuscation severely inhibits the work of moderate Muslims trying to free their faith from the grip of these extremists. Patel's only reference to the charges of Middle East Forum, in fact, appears to be a deliberate misquote. She writes that MEF "labelled Islamic Relief Canada a 'terrorist organization which regularly gives platforms to preachers who incite hatred against women, Jews, homosexuals and Muslim minorities.'" Islamic Relief does indeed regularly give platforms to such preachers -- Nouman Ali Khan is just one example in the weekly pattern of this charity and its branches across the world. But MEF did not claim that Islamic Relief was a "terrorist organization." I wrote that it was "financially linked with a number of terrorist groups." Islamic Relief branches have, for example, indeed given money to several groups in Gaza linked to the designated terrorist group Hamas. These include the Al Falah Benevolent Society, which the Meir Amit Intelligence and Terrorism Information Centre describes as one of "Hamas's charitable societies." And even if the Canadian branch of Islamic Relief claims not to have directly funded these Hamas groups, its own accounts reveal grants of millions of dollars to its parent organization, Islamic Relief Worldwide, which oversees the movement of money to a number of Hamas fronts. 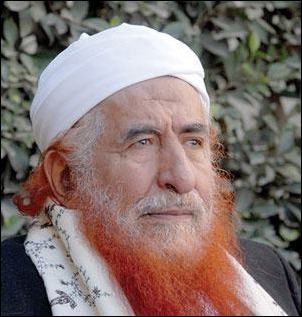 Islamic Relief branches also receive money from several terror-linked Middle Eastern charities, including those established by Abdul Majeed al-Zindani, whom the US government has designated a "Global Terrorist." Although MEF believes that Islamic Relief is financially linked to terror, no one wrote that the charity itself is a terrorist organization. Others, however, are less circumspect. In 2014, the United Arab Emirates designated Islamic Relief as a terrorist organization. And in 2016, the banking giant HSBC shut down Islamic Relief's bank accounts in the United Kingdom "amid concerns that cash for aid could end up with terrorist groups abroad." Perhaps Reyhana Patel hoped that by smearing the Middle East Forum, and telling her readers about her love of "diversity ... tolerance and inclusion," she could sell Islamic Relief as a force for good. The charity's regular promotion of hate preachers and financial links to terrorist groups, however, says otherwise. And is Patel herself really so dedicated to supporting peace and tolerance? Her social media posts and a short-lived career as a journalist suggest not. Patel has a history, it seems, of attacking organizations that oppose religious extremism. In 2014, Patel wrote an article condemning Student Rights, an British organization that works to expose homophobia, racism and other forms of extremism on campus. Without seriously addressing the group's research, Patel described the organization as "sensationalist and misleading." Sound familiar? Patel has also defended gender-segregation imposed by Muslim student groups at Britain's public universities, and then complained that Muslim women who oppose this misogynistic behavior "seem to want to discredit and deamonise [sic] me." Further, Patel has expressed praise for Malia Bouattia, a prominent student activist in Britain whose anti-Semitism was the subject of national media coverage. In 2011, Bouattia condemned a university with a large Jewish population as a "Zionist outpost." In 2014, she opposed a motion at a student conference that condemned ISIS on the grounds that such condemnation was "Islamophobic." That same year, a British parliamentary report concluded that Bouattia was guilty of "outright racism." If this is the company Reyhana Patel keeps, then perhaps Nouman Ali Khan's extremism is a perfect fit for Islamic Relief Canada. 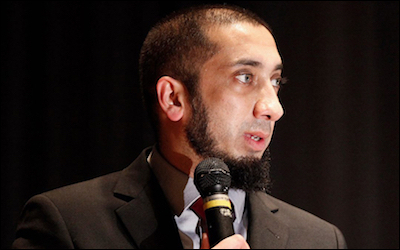 Perhaps Nouman Ali Khan's extremism is a perfect fit for Islamic Relief Canada. Islamic Relief was designated a terrorist organization by a pious Muslim country. Western banks have closed its accounts over terrorism concerns, and, just last month, Britain's Charity Commission starting investigating the charity for hosting a preacher who justifies killing homosexuals. The Islamic Relief franchise is a charitable front for extremism in the West. That it has managed to build a favorable reputation is testament to the careful doublespeak of its officials. Such duplicity should not be tolerated. Sam Westrop is the director of Islamist Watch, a project of the Middle East Forum.